Consider it an INVESTMENT in your bottom line. That's right, you get a RETURN for your participation. Whether it is a tax on architectural services, statewide code changes, or the legislative review of architects' licensure requirements, the Florida Legislature addresses issues that can cost you plenty. Architecture is among the most highly regulated -- and most complex -- professions of any field. By INVESTING in FAPAC, you raise the level of awareness of architects in the political process. Additionally, you can help elect lawmakers who are supportive of your political agenda, and most importantly, understand the nature of your profession. In recent years, FAPAC has targeted candidates that have made a difference. Through our political efforts and local input, we contributed to candidates who were major players and yes were elected. Each AIA chapter has a volunteer director acting as a spokesperson and representative for your interests. The directors are important players in delivering local issues to our legislators and returning local contributions. We have proven over the years that money in the right spot is an entirely more effective means of addressing our limited resources. 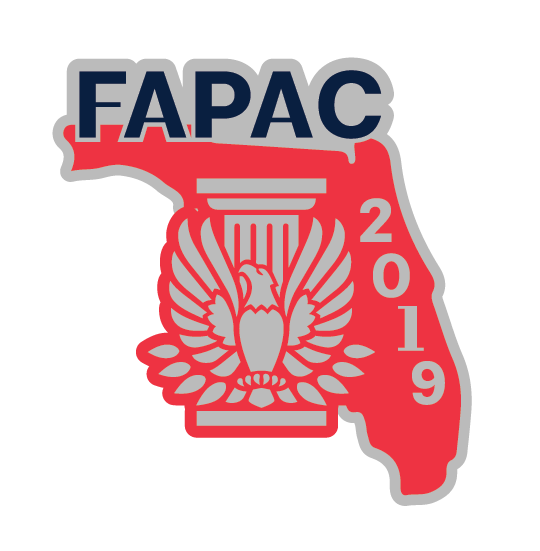 Locate the FAPAC director from your area and make your concerns known. Funding is largely attributable to INVESTMENTS from our individual/ corporate members. To read AIA Florida's ­extensive list of legislative accomplishments, click here. Please make checks payable to Florida Architects Political Action Committee. Mail your contribution to AIA Florida, 104 E. Jefferson St., Tallahassee, FL 32301. Contributions are are not deductible for Federal Income Tax purposes.